Book Blogger Hop: Not My Usual Genre ~ Love.Life.Read. Book Blogger Hop is hosted by Billy @ Ramblings of a Coffee Addicted Writer after Jennifer @ Crazy-For-Books needed to stop hosting it. This week's question: What was the last book you read from a genre you don't normally read? 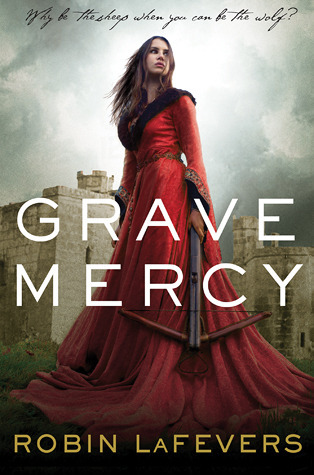 For me, I think the one that stands out seems to be Grave Mercy by Robin LaFevers. I love historical fiction but I have never really read historical fantasy books before. Can I just say I LOVED this book? As challenging as it can be to read outside of my usual comfort zone, it is how I find myself growing as a reader. If I only stuck to my comfort zone, I would have missed out on SO MANY books that I have truly loved. What about you? What book did you read recently that had you stepping out your comfort zone?